Peter Holman is a distinguished academic who believes in putting his research into practice. He is Director of The Parley of Instruments, Leeds Baroque Orchestra, Psalmody and Essex Baroque Orchestra. A particular champion of English music, he was founder and director of the ground-breaking English Orpheus series on Hyperion Records. He has also taught at many conservatories, universities and summer schools in Britain and abroad. He is Emeritus Professor of Historical Musicology at the University of Leeds. In addition to writing four acclaimed books, he regularly contributes to a range of newspapers and journals and has published many editions of early music. Taro Takeuchi was born in Kyoto, Japan. After completing his degrees in law and music in Tokyo, he came to England to study lute and early guitar with Nigel North at the Guildhall School of Music and Drama. Since leaving college, he has been in great demand as soloist and ensemble player, and has toured most European countries, Australia, New Zealand, Taiwan, USA and Japan. As a continuo player he has worked with The Parley of Instruments, The English concert, The Royal Opera House, The Orchestra of Age of Enlightenment, Berliner Philharmonic, as well as Sir Simon Rattle, Rachel Podger and Nigel Kennedy. He has made numerous recordings for Deux-Elles, EMI, Hyperion, Harmonia Mundi, BBC and others. Taro Takeuchi plays all types of lutes and early guitars, and specializes particularly in double strung early guitars, including 5-course Baroque guitar, English guitar (guittar) and 6-course Spanish guitar. His solo recordings FOLIAS! and The Century that Shaped the Guitar were received with critical acclaim and high praise. Taro presently lives in London, where he has an excellent collection of original early guitars as well as authentic traverse flutes, which he enjoys playing as a hobby. The Weber song was recorded for a lecture Peter is to give, in his front lounge. 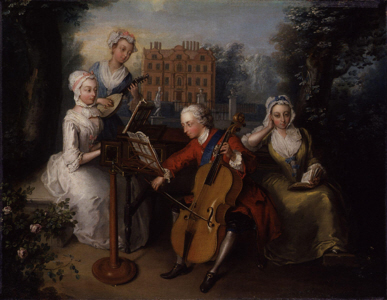 It is a musical illustration of "Frederick, Prince of Wales, and his sisters" by Philip Mercier, with harpsichord instead of cello.